Both gen Xers and millennials value services that are highly accessible, offering customized products, and exhibiting excellent customer support. Almost 50% of these generations do not watch TV since they prefer to view their favorite shows in an unfragmented and advertisement-free manner. Perceptibly, Facebook is the most popular social media site among generations. As for their distinctions, gen Xers were born between 1965 and 1980 while millennials were born between 1981 and 1996. Hence the current ages of the former are from 53 to 38 while those of the latter are from 22 to 37. The following discussions further delve into such differences. The popularity of “Generation X” is often attributed to several individuals involved in mass communication such as Robert Capa, a Hungarian photographer. In the 1950s, he used the term as the title of his photo-essay which depicted young individuals after the second world war. In 1976, Billy Idol, an English musician also named a punk rock band “Generation X”. Also, in 1991, Douglas Coupland, a Canadian author, entitled his book, Generation X: Tales for an Accelerated Culture. This cohort is also known as “The MTV Generation”, “The Doers”, and “The Post Boomers”. Since the gen Xers were raised in a zeitgeist of shifting societal values due to higher divorce rates and less adult supervision, their childhood to young adult behavior was sometimes characterized as pessimistic, lazy, and disillusioned. On the other hand, their more mature years were positively described as happy, full of life, and business-minded. Some of the popular Gen Xers from various fields are Jeff Bezos, Barrack Obama, Princess Diana, Demi Moore, Shania Twain, Andre Agassi, and Kate Moss. This moniker is largely attributed to Neil Howe and William Strauss’ book, “Generations” which pioneered the categorical description of individuals due to the common factors experienced during a time period. Millennials are also sometimes called “Generation Y” as they come after the gen Xers, “Echo Boomers”, and “Digital Natives”. The millennials are stereotypically known as narcissistic, easily dissatisfied, and easily distracted. These descriptions may be significantly influenced by the advancement of technology and the flexibility that comes with it. On the brighter side, they are also known to be success-driven, tech-savvy, highly adaptable, honest, and fun to be with. Some of the famous millennials from diverse turfs are Prince Harry, Bruno Mars, Keira Knightley, Stephen Curry, Mark Zuckerberg, Vanessa Hudgens, and Helen Oyeyemi. Gen Xers were born between 1965 and 1980 while millennials were born between 1981 and 1996. Hence the current ages of the former are from 53 to 38 while those of the latter are from 22 to 37. Approximately, the current world population is composed of 20% of gen Xers which is around 1.5 billion. On the other hand, there are more millennials at 25% which is more or less 1.9 billion. 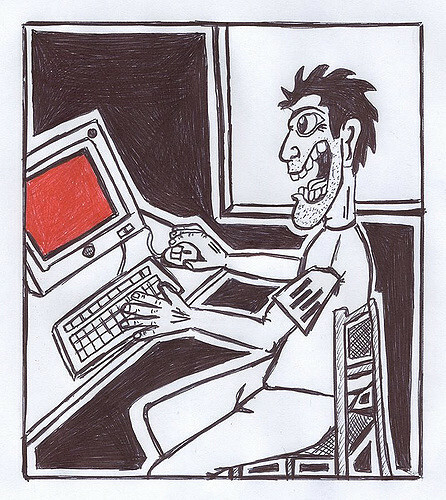 Gen Xers are also known as “Generation X”, “The Doers” as they are known to ‘make things happen’ and they learned to strive from the economic crises that their parents experienced, “The MTV Generation” due to the advent of music videos, hip hop, grunge, etc., and “Post Boomers” since they came after the baby boomers. Some monikers of millennials are “Generation Y”, “Echo Boomers” since they are the off springs of boomers, and “Digital Natives” because their generation did not experience life without gadgets and the internet. 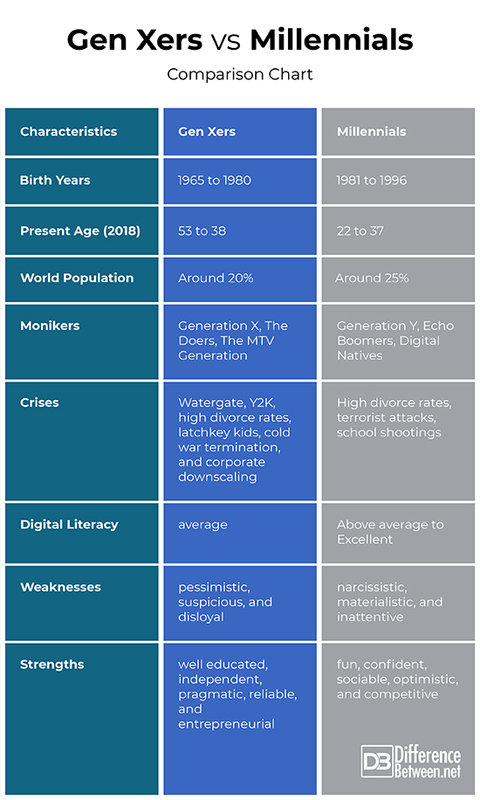 Some of the main crises that the gen Xers were exposed to were Watergate, Y2K, increased divorced/separation rates, more latchkey kids, termination of cold war, and corporate downscaling. As for the millennials, they grew up more comfortable with less economic crises but they also had to deal with high divorce rates, terrorism, and school shootings. A gen Xer, Zuckerberg, is famous for having founded Facebook. Though most members of the generation X are digitally literate, some are actually not that tech savvy like their younger counterparts, the “Digital Natives” who were already born in the age of gadgets and highly accessible internet. Gen Xers are stereotypically described as pessimistic, suspicious, and disloyal while millennials are narcissistic, materialistic, and inattentive. Several of the adjectives associated with the gen Xers are well educated, independent, pragmatic, reliable, and entrepreneurial. Among others, millennials are popularly viewed as fun, confident, sociable, optimistic, and competitive. Senior millennials have more common ground with gen Xers such as preferences regarding banking, TV shows, and social media usage. The popularity of “Generation X” is often attributed to several individuals involved in mass communication such as Robert Capa, Billy Idol, and Douglas Coupland. 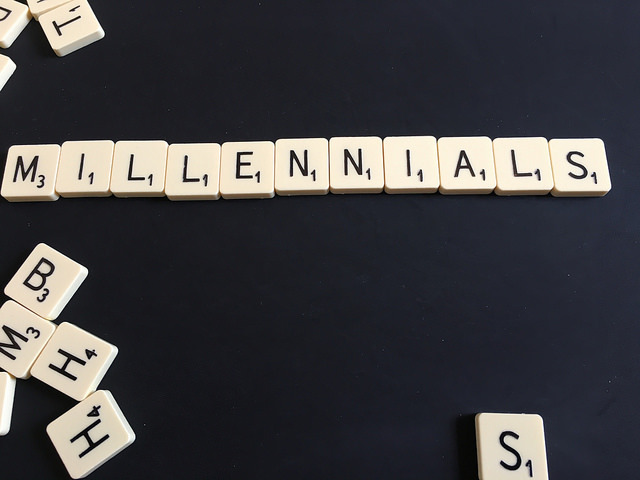 The term “millennials” is largely attributed to Neil Howe and William Strauss. There are more millennials than gen Xers. Gen Xers faced more economic crises. Millennials are more tech savvy than gen Xers. Gen Xers are stereotypically pessimistic, suspicious, disloyal, well-educated, independent, pragmatic, reliable, and entrepreneurial while millennials are narcissistic, materialistic, inattentive, fun, confident, sociable, optimistic, and competitive. gene balinggan. "Difference Between Gen Xers and Millennials." DifferenceBetween.net. April 2, 2019 < http://www.differencebetween.net/miscellaneous/difference-between-gen-xers-and-millennials/ >. The oldest Gen Xers, according to this article, were born in 1965. Former President Barack Obama, Demi Moore and the late Diana, Princess of Wales (more commonly known as Princess Diana) were born just a few years prior to 1965. Therefore, neither is a Gen Xer.